TANZO uses the Ethereum blockchain to build a comprehensive trading platform that leverages social capital and creates a community that fosters social interaction between users. The contribution to social capital in terms of value creation on the TANZO platform is facilitated through the User Reward System (URS). The URS is based on the TANZO token (TZO), an ERC-20 token that is allocated inside the platform. Rewards are relative to each user’s individual participation and contribution. This makes TANZO a true meritocracy — a model that excludes the need for third parties and provides the most efficient distribution of wealth between users. 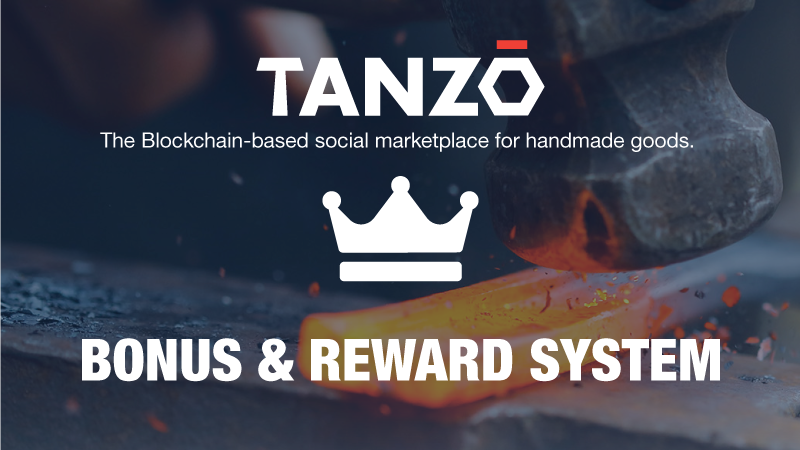 The reward system in TANZO encourages users to engage in social activities, which drive up the value of the ecosystem and the value of the TZO token. Every new potential customer will be awarded with TZOs upon registration. These tokens should only be used for platform activities. As a reward for first-time buyers for trusting TANZO and the crafter, initial purchases will be rewarded with TZOs. TANZO will reward with TZOs everyone who makes purchases for over $1000. These tokens can then be spent on any of the platform activities or even traded on the free market for some profit. After a purchase has been finalized and the buyer has received the item, he/she will have the opportunity to rate/review the quality of the item, as well as the crafter. 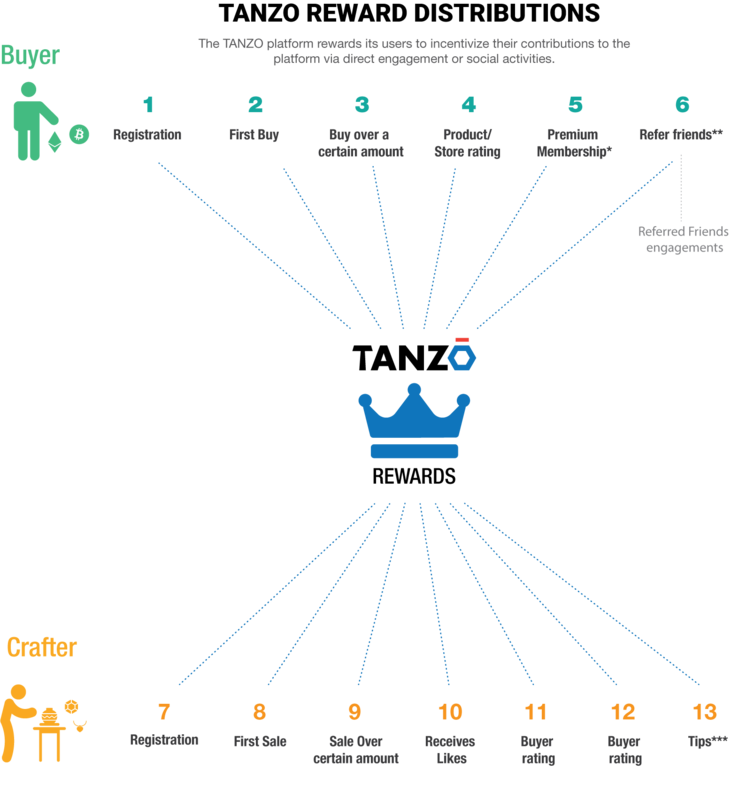 Those are two separate activities, sharing her/his opinion with others on the platform and helping them know more about the crafters, with each of these activities receiving TZO rewards. TZO tokens are awarded to referrers to a specific store or vendor. Referral points are promotional TZO rewards. Additional benefits include the advantage of being first in line to reserve certain rare and highly sought-after items. Every seller receives a certain amount of TZO. These tokens can only be used to cover the platform fees for his/her first listings. Crafters receive 1% in TZO. Basically, this is a bit less than our commission. When total sales reach specific milestones such as >$1000 or >$10,000, the seller will receive TZO tokens as a bonus. For every 1000 likes for certain product, the crafter receives a reward in TZO. A similar bonus is also awarded for every 1000 followers. After a sale has been completed and money has changed hands, the seller can rate the buyer. A reward will be distributed for the rating. A seller can rate the same buyer only once every 30 days. Crafters will receive a TZO reward for each month they are able to maintain a rating above 95%. TANZO provides an additional incentive to crafters who are holding a large amount of TZO tokens in their wallet by lowering their listing and transaction fees. A crafter can receive tips in TZO from everyone on the platform, e.g. from satisfied buyers or from fans of his/her work. These tips will accumulate and be given to the crafter when the amount reaches $10. These tokens can only be used for activities on the platform. A crafter may lose his/her tips if his/her rating drops below 80%. If tips are not used by the crafter within 90 days, TANZO will use them to incentivize others on the platform.